Details out today of the Gelato in the Square festival put together by Gelato Village. Daniele and Antonio have been regularly going back to Italy and building a name for themselves in the gelato fraternity – with such effect that the flow is being reversed and some of Italy’s top makers are coming over to Leicester to celebrate all things gelato and the Slow Food approach in general. Over the weekend of 27-29 October there will be a huge range of talks, demonstrations and events in the St Martin’s Square café. Every hour or so from 11am on Friday there will be presentations from both local partners such as Belvoir Ridge Creamery who supply their milk and from also Italian artisans such Paolo Brunelli, a man celebrated as the “visionary poet” of gelato. Others will talk about wine, biscuit and cone making, while local bars and restaurants will also be represented with Charlotte Wood from Manhattan 34 leading a session on cocktails and gelato and Antoni Scarpatti of Anstey’s marvellous Sapori will address food matching. There will also of course be chances to sample and purchase exciting flavours of gelato made in Leicester by the visiting makers. It all looks an lot of fun. All events are take place in the shop and are free on a first come first served basis. The full programme is attached below, and should be readable once you click on the images. I spent an interesting hour last night in St Martin’s Square at one of Gelato Village’s Gelato Bites events, which are giving food enthusiasts a chance to hear from some of the brilliant food producers and retailers in our county. The event saw a presentation from Alan Hewson, whose herd of Red Poll cows at Eastwell , north of Melton, not only supply the milk and cream for Gelato Village but also for their Jamie Oliver-endorsed Colwick Cheese, traditional local brie-a-like Slipcote cheese and the summertime hard cheese Ironstone. The Hewsons, like the Gelato Village lads, support Slow Food principles and reject the high yield at all costs approach, farming with rare breed cattle that produce maybe only a third of the intensively pushed dairy breeds. These smaller, hardier breeds can spend almost all of the year outdoors and over the coldest months can get by on hay, silage and a salt-lick. The Hewson’s don’t homogenise or standardise the milk, producing milk which not only has a cleaner, lighter taste but which is a genuinely seasonal product – one that changes as the composition of the meadow grasses change over the year. The quality of the milk – which won best in show at last year’s prestigious Nantwich Cheese Show – contributes directly to the quality of the gelato. That much was perfectly clear on the night from our tastings of the milk and GV’s Fior de Latte (“Blossom of the Milk”), the simple basic gelato which is the touchstone of quality for any producer. The read-across in flavour was clear. Gelato Village is the only producer in the UK that makes all is product with the milk of a single herd. And an exceptional herd from the same county too. We should treasure both of them. Future Gelato Bites events will be on Tuesday 14 and 21 March and will look at matching gelato with pudding wines, and in what’s said to be a world first, a beer and gelato matching event. Cost is £10, more details and booking information here, or avoid a booking fee and enquire in-store. There’s been welcome confirmation this week that Canteen – the Street Food night previewed in December at LCB Depot in Leicester’s Cultural Quarter – will continue as a regular monthly “last Friday” event from February. The next event will be on Friday 24th, which neatly coincides with the Comedy Festival and will feature stand-up as well some of the UK’s top street food outlets parked in the rear yard, a DJ, full bar and a specialist cocktail bar. Among the traders will be Birmingham-based Baked in Brick, winners of the 2016 UK Street Food Awards. Founded by an alumni of the Le Manoir aux Quatre Saisons no less, they serve Neapolitan style pizzas from a wood-fired oven out of the back of a 1964 Mini Cooper (and grilled chicken tikka from the front). The evening is billed as a place for “friends and families, creative types, city residents, students and stressed out city workers to mingle and have a great evening” and judging by the December evening they’ve got the mix right. It runs from 5pm-11pm and entry is free, with children welcome until 9pm. Each trader will be offering a vegetarian offering. One quick note – it seems to be public news now that the next St Martins/Crafty project I alluded to in an earlier post will be the renovation of the Richard III pub on Highcross St as a high quality dining pub. There is backing from Everards for the conversion and I’m entirely confident that the St Martin’s team will do a great job of creating a go-to dining venue. Liking the look of two openings in Leicester city centre later this month. Veeno is an Italian “wine café” adding to the burgeoning St Martin’s scene. This is a small independent chain which has branches in the usual places that such ambitious concepts expand into – Nottingham, York, Manchester, Edinburgh, Harrogate, Leeds, Bristol and Liverpool. The business was founded by two young UK-based Italians and their idea was to promote the “aperitivo” culture of nibbling appetisers over a glass of wine. 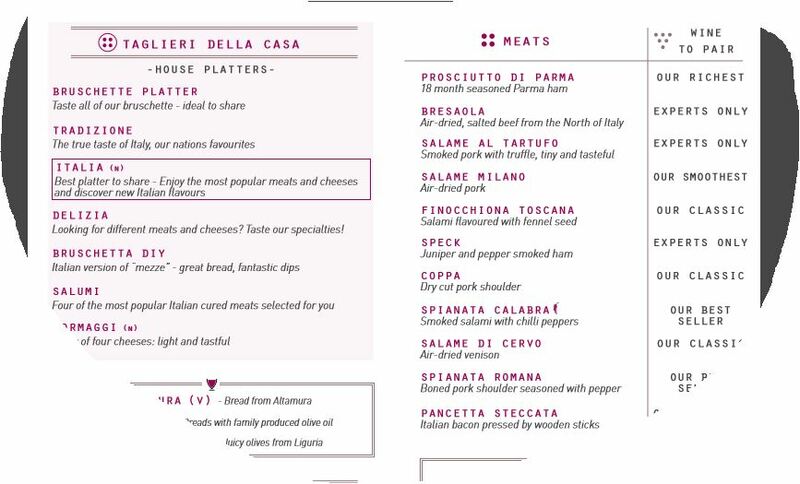 The menu, then, is full of salamis and cured meats, cheeses and breads along with a wine list that is based on wines from their own Sicilian vineyard. These are labelled along the lines of “our driest” “our smoothest” and rather curiously , “for experts only”. The menu has plenty of food and wining matching. I’ve not been to one of their cafes so can’t really comment on quality but from their online presence the vibe would appear to a slightly mass market Delilah – not such a bad thing . Also set to open in a couple of weeks is Boneyard. Here the obvious at first glance comparison would appear to be Grillstock, with a focus on barbecue food, cocktails and a “woo! let’s all have mad time!” culture. They will be at 13 Granby St, in what was for many years one of those identikit Italian chains, next to the Nat West Bank. Don’t know too much about them – all I could really find out was they seem to hold the not inconsiderable distinction of holding the first ever pop-up restaurant night in Nuneaton with an Indian restaurant. Their twitter account describes them as “a multi-cultural meat society with added liquor and DJs – unashamedly fun, brash and exciting”. I can’t say I’ve been impressed with Grillstock so let’s hope this crew have something good to offer. Now that Delilah has got its feet firmly under Leicester’s table, it’s starting to run the wine and food evening events that have become popular at it’s Nottingham branch. The first one of these themed evenings ran last night and focused on the wines of Lombardy and the Veneto. They were presented with great enthusiasm by wine buyer Rick Tryner, who’s collection is full of wines from owner-managed wineries, often small family concerns in up and coming areas. It means there’s not much at the cheaper end of the market but lots of interesting, full-flavoured exciting wines. The events involve around 8 wines, matched with generous-canapé portions of food from Delilah’s chefs and using ingredients on sale in the deli. Our evening started with a creamy prosecco (£12.99)- their best selling wine – to go with very posh truffle-scented crisps and nuts. Then an entry level Soave Classico (£7.99) with a brilliant sharp ceviche of seabass. Then two more serious whites – a peachy. very lively 100 per cent Turbiana I Fratti (£18.99) matched with a fantastic lobster ravioli, and an upmarket Soave “La Rocca” from Pieropan (£28.00), which stood comparison with big white burgundies. That came with more excellent pasta – handmade in Italy and imported fresh – this time in a creamy wild mushroom sauce. Then four reds, starting with a Valpolicella Classico from Zenato (£13.99) – soft and gluggable but still complex – served with lovely little tomato and mozzarella arrancini. Then a Zenato Ripasso (£24 – Valpollicella that has been “repassed” over the used grape skins of an Amarone), a big beast of a wine that was beautiful with strips of rare bavette steak from the Vale of Belvoir. Then for me the star of the night – Marion, a big 2010 cabernet sauvignon from Veneto (£30) bursting with fruit, for which Delilah is the only UK supplier. The rest it seems goes to the USA where it is seen as a rival to those fabled Napa Valley reds. This was magnificent with some Italian cheeses including a 36-month aged parmesan and a sensational creamy number from Beppino Occelli that was wrapped in grape must. We finished with a sweet red Veronese Recioto della Valpolicella (£22), where selected grapes are dried for three months on wooden racks then pressed and fermented to create a desert wine that is full of fruit and floral notes. A high-end tasting like this, with simple but excellent food, is yet another feather in cap for St Martin’s. Just a few back I could never envisaged saying this but within literally a few paces we have wines, gelato, burgers, chocolates, gins , cocktails, charcuterie, coffee and cheeses that are the equal of anywhere in the country. People often tell me Leicester lacks a good steak house. There are a couple of candidates- from 1583 on the edge of Highcross to a couple of Halal places catering mainly, obviously, for Muslim communities. They seem to do good business but don’t really appear to have established a name for great steaks. Now however we have an interesting new arrival in the shape of Middletons Steakhouse and Grill. This is small chain with big ambitions, that started as a gastro pub in the eponymous Norfolk village. But, says MD Steven Hutton, ” changes in the market place saw the fortunes of pubs decline and it became clear family restaurants were the way forward.” They rebranded as a steakhouse and now have branches in Norwich, Kings Lynn, Colchester,Watford and Milton Keynes. Their Leicester project is a big one – they’ve taken the Grade II listed former Nat West and TSB building in St Martin’s, empty for some 16 years, and invested £1.5 m into converting it into a 200 cover restaurant. It’s a stunning space. A tremendous set piece chandelier dominates the room which is done out with warm red banquettes, and there’s a large mezzanine area that gives you a chance to survey those below you. I got invited along to try the food on one of three preview nights. The place was buzzing and there was a slightly manic atmosphere, not least around the pass where wait staff queued up as the kitchen struggled somewhat to keep up. With service routines obviously not quite up to speed I won’t comment too much other than to say our young Slovak waiter was a complete pleasure to deal with, though unfortunately one other waitress did manage to throw a side order of mushrooms all over our table. I’ll put that down to third night nerves. In fact despite some frazzled faces on the staff, we didn’t have excessive waits or other issues. The food though. The menu is pretty mainstream reflecting that desire to be a successful family restaurant and take on some of the well-known chains. We started with mussels (£5.25) done in white wine, cream garlic and lemon which were completely fine. Rather better than fine was “Middleton’s terrine (£5.25) combing pork, liver, cider and herbs and wrapped in Serrano. I enjoyed this immensely – good flavours, good coarse textures, lovely salty ham. It was curious then that the “pickled relish” it came with was a strong traditional chutney of the Branston variety – not unpleasant in itself but far better suited to a cheddar sandwich than this lovely terrine. The steaks we are not told much about other than they are “carefully prepared at our butchery in Middleton”. I had an 8oz rib-eye (£15.95) and was quietly impressed. Cooked accurately to medium rare it was tender and had a nice char – it wasn’t going to keep the likes of Hawksmoor or Goodman’s in London awake at night but then it didn’t cost £35. It passed muster fine. My choice of Diane sauce (£2) was a good one – well-made and tasty. Fries were good, though the garnish of “roast tomato” was misnamed – it had barely cooked at all. Steaks go right up to an 18 oz chateaubriand or a 36 oz rib eye on the bone for sharing, and there are other choices such as jerk or piri-piri chicken, ribs, lamb steak, pork chop, surf and turf and a range of burgers. There’s not much to intrigue any vegetarians who get dragged along here – breaded brie with chilli jam, vegetable and halloumi skewers, falafel burger and that’s about it. Several dishes are offered “half and half” for the hard of decision-making, and we had a 6oz sirloin with half rack of sticky ribs (£15.50). Again the steak was good, but the ribs were very ordinary – a rather sharp, vinegary sauce and ribs that were redolent of supermarket vacuum packs. Deserts “made in house by our pastry chefs in each of our restaurants” are the usual suspects – sticky toffee pudding, Eton mess, chocolate brownie, tiramisu and so on. My chocolate pot (£5.15) was thick and overly sweet, with a layer of even sweeter caramel, while a crème brulee (£5.15) was ok but unremarkable. Wines range from £16 to £50 for a Barolo riserva, and rather curiously they don’t list the country of origin. It may be obvious in many cases but it’s a pretty crucial piece of information. We had a Dona Paula Malbec (£21.95), which I assumed correctly to be Argentine, but wasn’t overly impressed – lacked much in the way of tannins or varietal character. The opening of Middleton’s is a great vote of confidence in Leicester and it’s terrific to see one of our most impressive buildings come back into use. It’s located right in the heart of a thriving area of independents and the hope must be that it brings more diners to the area and lifts all boats. It may not have the interest for foodie types of the more or less adjacent Delilah’s, Crafty, Cured, Gelato Village and others but it does ok on its own terms and is a welcome alternative to Highcross. The St Martin’s area is booming. Finding a buried king, building a tourist attraction and a public square and investing heavily in improving the public realm will generally do that. But you also need an entrepreneurial spirit to make the most of those developments and Leicester’s independents have certainly risen to that challenge. And now with the opening of Delilah’s the area has another bright jewel in its crown. The dynamism of Leicester’s retail core attracted Tryner to branch out with a second branch. Fortunately there was a lovely empty building right in the heart of St Martin’s that was perfect for redevelopment. Consequently the Victorian, Grade II-listed Allied Irish Bank has been revived from years of slumber – with help from public funds – and turned into a light, roomy and remarkable space. The venue resembles the Nottingham branch with a large retail floor, a horseshoe shaped bar with stools for diners and drinkers and a mezzanine dining area that takes diners close to the beautifully-restored glazed ceiling and masonry. The deli offering is huge, diverse and beautifully displayed, and much of it is used to furnish the cafe menu. During its first week I called in for morning coffee, a lazy weekend brunch and a midweek working lunch – and all three were first-rate. In terms of coffee there’s a house blend named Samson but also some 30 coffees which are listed with helpful information on the bean and the roast. I tried Rwandan Koakaka, which was tremendous. With St Martin’s Tea and Coffee round the corner and the newly-opened Coffee Counter cafe roasting their own small batches on Bowling Green Street, Leicester city centre is thankfully no longer left to the big coffee chains. The breakfast menu at Delilah, which runs until 11.30am during the week and 12pm on Sunday, is hugely appealing. Dishes are not cheap but this is very high quality produce. I was tempted by Inverawe smoked salmon and scrambled eggs but settled for the Delilah rarebit, which had the same relationship to cheese on toast as Ngolo Kante to …well, pick your own hapless City midfielder from the past. Pokey Black Bomber cheddar had been whisked with Magpie ale leeks and mustard and grilled on a doorstep of artisan bread, then topped with generous amount of splendid Alderton ham, a succulent Nottinghamshire ham with a marmalade glaze and one of the best of its kind I’ve ever encountered. Then there were two perfectly poached egg, the yolks of which oozed delightfully over the whole ensemble. My friend picked avocado, fried eggs and crispy pancetta on toast. Again, every thing was exceptionally good. Ripe fruit, great bread, and intense salty ham. Lunch items have a similar vibe to these dishes. Don’t go looking for fancy restaurant cooking but if the idea of fine charcuterie, cheeses and salads appeals, you will love Delilah’s. At our working lunch I had a frittata with spicy chorizo and piquillo peppers and a super-fresh green salad, my friend having the salt-beef and morcilla hash, again topped with a poached egg . The only criticism he could think to make that it was almost too good – not quite having the down-and-dirty comfort food quality some will want in a hash. But the powerful flavours of the salt beef and the rich Spanish black pudding made it very tasty. We also managed to squeeze in a sideplate of charcuterie – a peppery salami and shavings of speck and serrano, and washed it down with a fine craft beer. The deli section at Delilah’s is going to fill-up a lot of Leicestershire pantries and fridges, and their cafe offering will provide the perfect venue for some top-notch breakfast and lunches. A real boost for the city centre. So last night I was invited to a preview event at another new restaurant in booming St Martin’s. This time it was a Mexican/South American venue Bodega Cantina, located in what was the Sweater Shop. It’s an independent business with branches in Birmingham and Worcester, so it’s good to see Leicester chosen as the next location. It’s a casual sort of place with a great bar packed with exotic mescals and rums and it’s run with great enthusiasm by general manager Ben who has a background with Pizza Express and TGIFridays and chef Ellis Andrew, who had been working round the corner at The Case. While menus across the group are the same, the message put out last night was very much that all food is produced fresh on site and that chefs have the freedom to buy locally. Judging by what we were able to sample last night the food is closer to Las Iguanas than to Wahaca – fun, tasty and enjoyable but more the background to a night out than destination dining or breaking the mould. Dishes range from the street food vibe of quesadillas, burritos and nachos through to smaller dishes such as Brazilian coxinhas and sea bass ceviche and larger plates including Venezuelan chocolate chilli chicken and grilled swordfish with mango salsa. There’s a vegan menu too. Prices are moderate, the cocktail list extensive and – as far as it was possible to tell – it’s going to be a cheerful, buzzy sort of place. It opens properly on Monday – and I predict a lot of people are going to have fun nights out here. 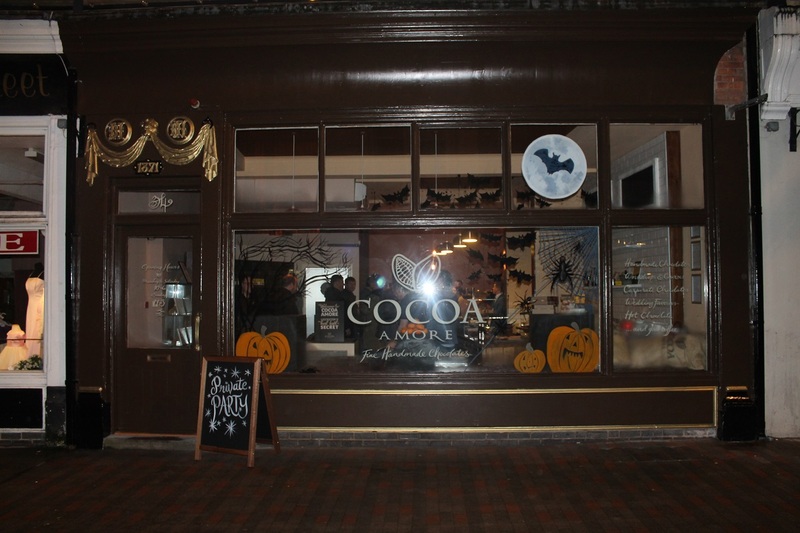 It’s good to see that Cocoa Amore has successfully relocated to the St Martin’s area, further fuelling the sense that there’s a high quality independent food and drink cluster emerging there. The company has relocated from Silver Arcade to larger, two-story premises on Silver Street. 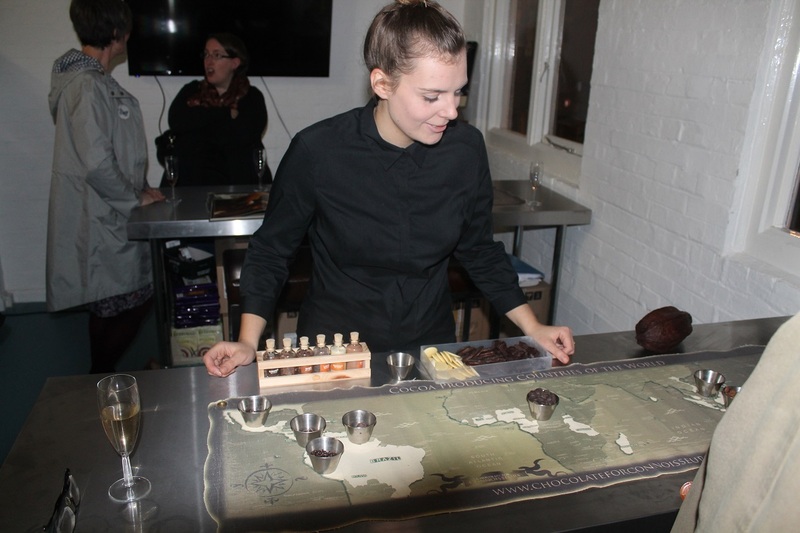 I was fortunate to get a Wonkaesque Golden Ticket for their launch last week and had a thoroughly enjoyable evening checking out not only their great chocolates – single estate nibs through to really superior truffles – but some savoury dishes too. Canapes included smoked duck breast and mackerel on chocolate bread – which all worked surprisingly well. 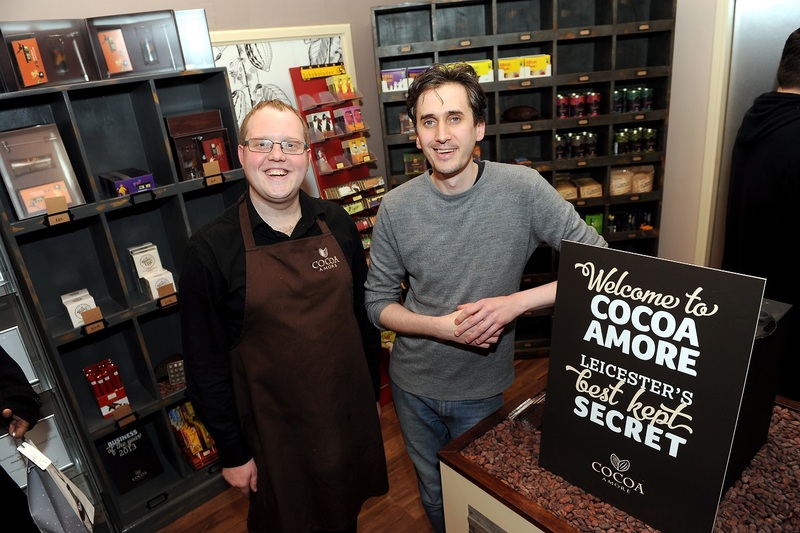 The new shop is licensed and while not promoting itself as a bar, matching chocolate with wines and spirits is going to be of the attractions. 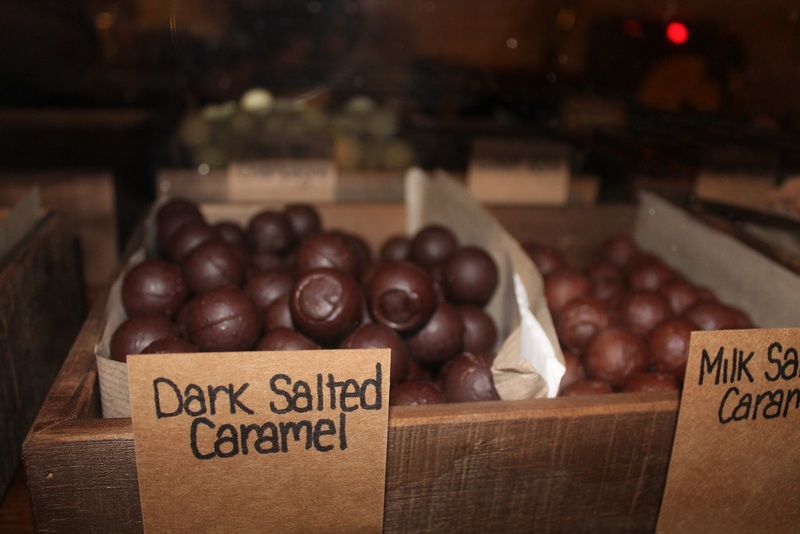 Upstairs is the production area and space for workshops where couples and small groups can learn about chocolate production around the world and make their own chocolates. The business was only formed three years ago and has won numerous awards, including being one of only ten businesses to be invited to take part in the Chancellor’s Downing Street Christmas Market. I won’t hold that against them though and look forward to see them thrive in their location, just a few yards from great businesses such as St Martin’s Tea and Coffee and Crafty, Gelato Village, the Case and its Champagne Bar and the soon-to-be-opened Burleigh’s Gin Parlour.